Lightened die-cast aluminum upper and alloy lower body reduce weight. Aluminum parallelogram increases actuation and precision. Special lightweight rubber pulleys reduce friction and noise. 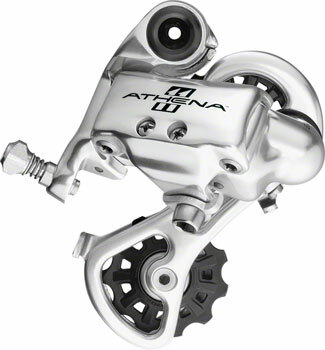 Available SoonSorry, 'Campagnolo Athena Rear Derailleur - 11 Speed, Medium Cage, Silver' is currently out of stock. Please check back later or contact Bikeman for an expected availability date. Refer to our Shipping Terms for more information.